Over 115 high schools from 10 different states competed at this national tier competition. Westwood not only received the First Place Debate Team honors but also won the First Place Overall Speech and Debate Team Sweepstakes award. This is the first year in the program’s history that they have received both awards at the University of Texas. With the impressive performance, the team continues to reinforce their ranking as the top program in Texas and the tenth best program in the United States. 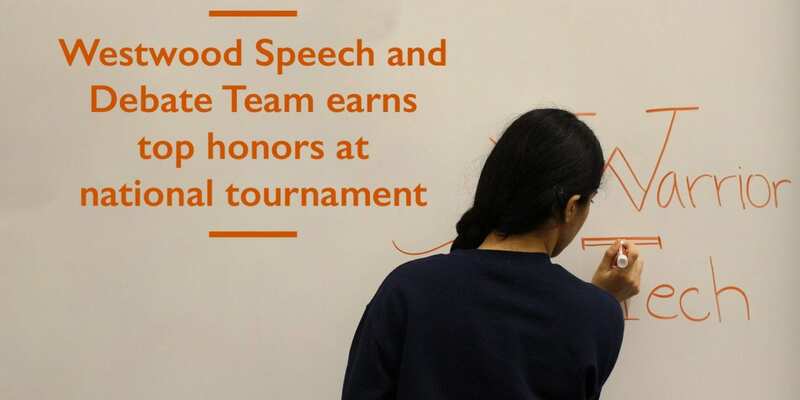 Top award winners include Westwood junior Anurima Mummaneni who earned first place in the event of Foreign Extemporaneous Speaking. With her win, she is now double qualified for the National Tournament of Champions. Fellow juniors Vikas Burugu and Daniel Shi also earned First Place in the event of Policy Debate. The win secured their qualification to the Tournament of Champions.